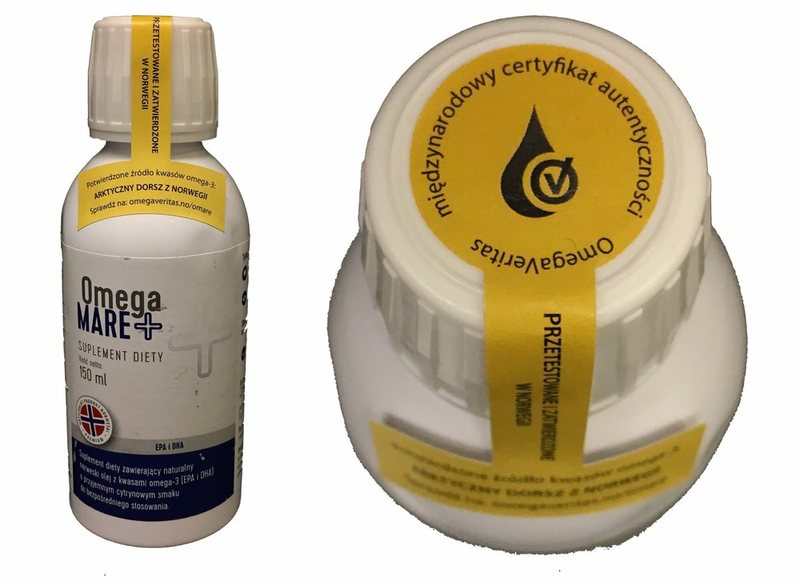 As the first Cod Liver Oil (CLO) brand in the world, the authenticity of the brand OmegaMare+ offered and owned by Natural Pharmaceuticals (NP), has now been verified by OmegaVeritas (OV) through an independent 3rd party authenticity test. This revolutionary test guarantees that all batches of OmegaMare+ originates from Norwegian Arctic cod. OmegaMare+ is the second brand in NP´s product portfolio which earns the OmegaVeritas verification seal. The salmon oil product OmegaMarineForte+ was approved earlier this year. The OmegaVeritas test is based on a validated and trustworthy routine. In addition to sampling and laboratory testing of all product batches, products will randomly be picked from store shelves/web shops by independent 3rd parties and tested by OmegaVeritas. – As the first CLO producer in the world, Vesteraalens have entered into a closer collaboration agreement with OmegaVeritas. In addition to the signing of a running Sampling Partner Agreement, we have different R&D topics planned. We also intend to enter into a running verification program for our CLO in 2017, says CEO of Vesteraalens, Viktor B. Johnsen. The development project with Vesteraalens will allow OmegaVeritas to expand their services In the CLO market. The first available version of the CLO-test is now fully validated and commercially available on the Natural Pharmaceuticals product OmegaMARE+. Every bottle of OmegaMare+ is now equipped with a OmegaVeritas-seal, confirming the authenticity of the CLO source. As brand owners, Natural Pharmaceuticals is first of all using the OmegaVeritas test to give the consumers the important information that they can trust & relay on the Norwegian origin of the content in OmegaMARE+. – We have never had doubt in our suppliers – so it was no big surprise that OmegaVeritas confirmed that our OmegaMARE+ consists of the highest quality cod liver oils from Norway. But since there is a wide range of CLO supplements offered, we hope this new seal will work as the extra assurance our customers deserve when they choose to buy our products. We are already convinced that 3rd party testing is the only true way to assure our customers, and we expect this new origin seal from OmegaVeritas to be recognised as the gold standard among omega-3 supplements. – Following the successful launch of krill and salmon oil authentication earlier this year, cod liver oil was a natural next step for us. Products branded as pure CLO might be a blend of cod and other fish species. Therefore we really see a great potential in this test. Every brand with 100 % CLO as OmegaMARE+ should protect their label claim by start using our origin verification seal. The launch was originally set for Q2 2017, but a substantial interest from the market made us speed up the development and launch this already now, says CEO Svein Erik Haugmo from OmegaVeritas. OmegaVeritas offers subscription programs with random analysis and mandatory next-level-in-value-chain checkpoints, batch certifications, product, as well as product screening and benchmarking. The range of verified categories is constantly under expansion, and several are in development at present. Newer PostNew name, new logo - Same company! Older PostOmegaVeritas proudly announce The Scoular Company as their next collaboration partner!